Welcome to the PRS Virtual Museum. Please use this as a reference resource and please do not post on this thread. Any changes requested because of errors or new information please let me know in a PM and I will update the entry. Thank You. PRS = Platts Richmond Spencer. Eddies surname - his wife's maiden name - his mother's maiden name. Case: 316L stainless steel with screw back and decoupling screw down crown. Finish Bead blasted. Dimensions: Diameter = 44 mm, 15.6 mm thick and 54 mm lug tip to lug tip. Lug spacing is 22 mm. Case: Stainless steel case with screw back and screw down crown. PRS-3 finish is mixed brushed and polished PRS-4 is PVD. Bezel: Unidirectional with 60 clicks. Dimensions: Diameter = 39 mm across the bezel, 45 mm across the case to the tip of the protected crown, 47 mm lug tip to tip and 11.45 mm thick. Lug spacing is 20 mm. Movement: Ronda 715Li lithium powered with 10 year battery life 5 jewel Swiss Made version with gilt movement. Dial: Available in Black or Orange. # Produced: 150 in S/S, 150 in PVD in each dial color. Case: Stainless steel assymetrical case with a screw back. Finish is bead blasted. Case: Brushed stainless steel case with polished screw back. Case: Stainless steel case with a fine brush finish Screw down back and crown. A limited number (39) were available plated in gold commonly known as the Goldbird. Weight: 70 grammes including strap ±2 grammes. PRS-9 Czech Air Force Longines Homage (in developement). Dimensions: Diameter = 36mm diameter, 42mm lug tip to lug tip and 9.8mm thick . Lug spacing is 18mm bars are fixed. Dimensions: Diameter = 38.6 mm diameter including crown, 42.4 mm lug tip to lug tip and 11.25 mm thick . Lug spacing is 20 mm. Case: Stainless steel case with screw back and screw down crown. Finish is PVD. Bezel: Unidirectional with 120 clicks. Crystal: Flat sapphire with anti-relective coating on the underside. A limited run (aprox. 25) were manufactured with the DN style hands. I had to remove the pic as the new software acted up. Case: Stainless steel case with screw back and screw down crown finish is brushed. Dimensions: Diameter = 38mm, 49mm lug tip to lug tip and 14.3mm thick. Lug spacing is 20mm. Case: Stainless steel case with screw back and decoupling screw down crown Finish brushed steel sides, polished top and back. Bezel: Unidirectional bezel with luminous numbers in the bezel insert sealed with hardened acrylic. Movement: ETA 25 jewel automatic, calibre 2824-2 (standard). 9 PRS-14's were made with PVD cases. Case: Stainless steel case with screw view back and screw down crown. Finish is brushed. Dimensions: Diameter = 29mm, 36.5mm lug tip to lug tip and 12.5mm thick. Lug spacing is 14mm. Bezel: Unidirectional bezel 120 clicks. 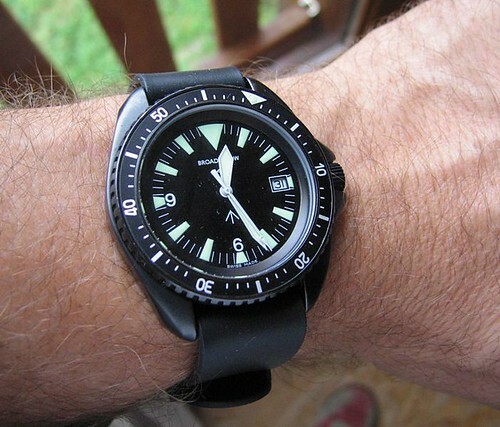 12 hour bezel to enable displaying the time in a second time zone is optional. 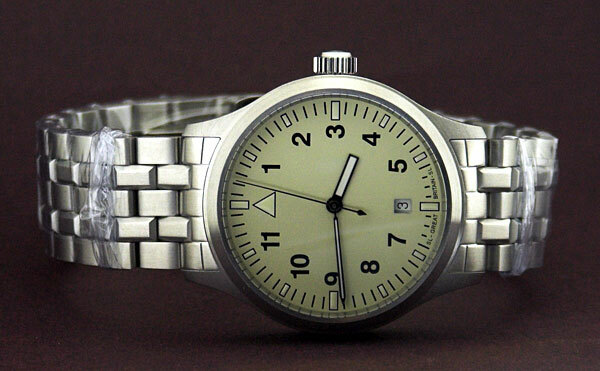 A - ETA 25 jewel automatic, calibre 2824-2 (standard). C - ETA 27 jewel quartz chronograph, calibre 251.262 30 month batery life. PRS-17-C pic borrowed from Eddie till I get my own. Case: 316L stainless steel with screw down sapphire glass back and decoupling screw down crown. Finish polished. Movement: ETA (Unitas) 17 jewel hand winding, calibre 6198-1 (18,000 BPH). Modified by Soprod with screwed balance and blued steel swan-neck regulator. Decorated with Geneva Stripes, perlage and blued screws. Glucydur balance, Anachron hairspring and chronometer grade (soigné), adjusted in 3 positions. Case: 316L stainless steel with screw back and screwdown crown. Finish brushed. Weight: 165 grammes on bracelet. Movement: ETA 2824-2 25 jewel automatic movement the first 50 are fitted with a chronometer grade that has a Nivarox hairspring and Glucydur balance adjusted in 4 positions. Note: the first 49 (Eddie kept #1 as is tradition) sold out in 2 minutes and 31 seconds on October 4th 2008. First picture Eddie posted of the Ivory dial variant. Case: 316L stainless steel with screw back and screw down crown. Finish Polished. Bezel: Unidirectional 60 clicks domed acrylic. Dimensions: Diameter = 42 mm, 15.3 mm thick and 50.7 mm lug tip to lug tip. Lug spacing is 22 mm.